WHAT A GREAT TRUCK!!!! 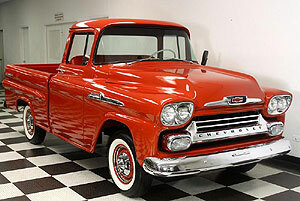 1958 CHEVROLET APACHE, BRAND NEW RED AND WHITE APACHE FLEETSIDE PICK UP. THIS TRUCK IS BRAND NEW FROM TOP TO BOTTOM. The frame, undercarriage and metal structure of this truck is beautiful. 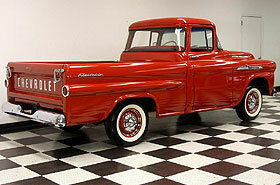 The truck has brand new paint over a solid metal body. The red and white accented interior redone and is like new and in beautiful condition. The chrome and stainless is like new the wrap around glass is like new the 6 cylinder engine purrs like a kitten and gets pretty good gas mileage. The three on the tree transmission shits flawlessly and is a blast to go through the gears. 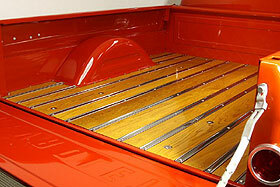 The truck bed is dent free and has brand new oak with brand new stainless strips.